Objective: Dual-layer mesh products are optimal for a subset of ventral hernia repair. While small umbilical defects are easily accessed through a single incision, intraperitoneal visualization is limited and only possible prior to mesh placement. 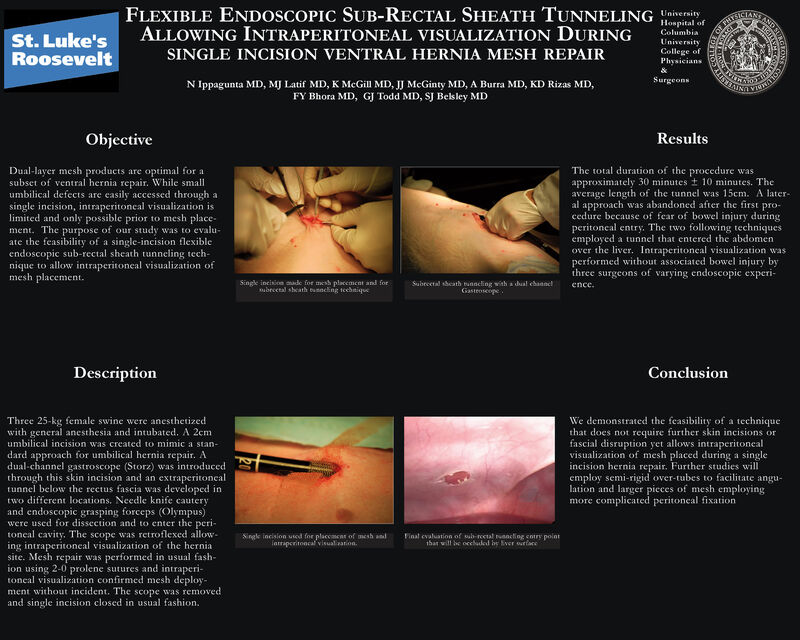 The purpose of our study was to evaluate the feasibility of a single-incision flexible endoscopic sub-rectal sheath tunneling technique to allow intraperitoneal visualization of mesh placement. Methods and Procedures: Three 25-kg female swine were anesthetized with general anesthesia and intubated. A 2cm umbilical incision was created to mimic a standard approach for umbilical hernia repair. A dual-channel gastroscope (Storz) was introduced through this skin incision and an extraperitoneal tunnel below the rectus fascia was developed in two different locations. Needle knife cautery and endoscopic grasping forceps (Olympus) were used for dissection and to enter the peritoneal cavity. The scope was retroflexed allowing intraperitoneal visualization of the hernia site. Mesh repair was performed in usual fashion using 2-0 prolene sutures and intraperitoneal visualization confirmed mesh deployment without incident. The scope was removed and single incision closed in usual fashion. Results: The total duration of the procedure was approximately 30minutes ± 10minutes. The average length of the tunnel was 15cm. A lateral approach was abandoned after the first procedure because of fear of bowel injury during peritoneal entry. The two following techniques employed a tunnel that entered the abdomen over the liver. Intraperitoneal visualization was performed without associated bowel injury by three surgeons of varying endoscopic experience. Conclusions: We demonstrated the feasibility of a technique that does not require further skin incisions or fascial disruption yet allows intraperitoneal visualization of mesh placed during a single incision hernia repair. Further studies will employ semi-rigid over-tubes to facilitate angulation and larger pieces of mesh employing more complicated peritoneal fixation.